In my youth, I spent a great deal of time working as a "barista" (really thought of myself as a human coffee maker...kind of a bald Mr. Coffee, if you will) and tampers were an extension of my hand. To this day I sometimes mime the tamping motion when making espresso before I catch myself. My espresso machine doesn't require tamping. Purists everywhere are shaking their fists at their computer screens as they read this. Sorry. 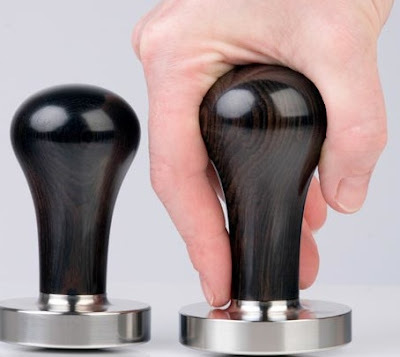 So imagine when I came across these tampers. The one I used for years was plastic. It did the job. I never thought of it other than it's smart, utilitarian purpose--thought the shape was well designed but it never occurred to me that it could be beautiful. Maybe I needed more coffee. 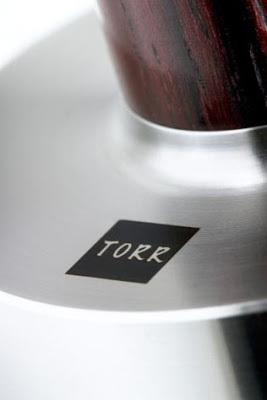 The kids at Cafe Kultur have created TORR, the most beautiful espresso tampers I've ever seen. 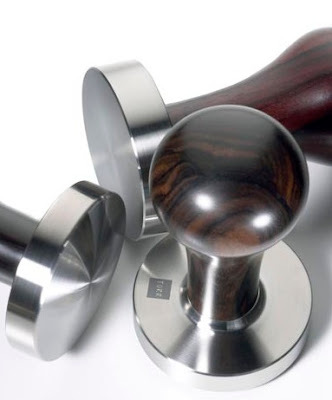 Each tamper is handcrafted in a variety of handles and in two different piston sizes. 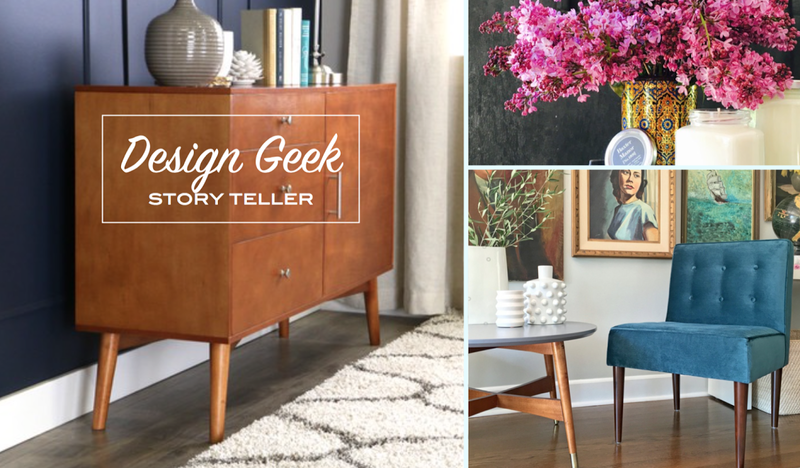 It's simple, functional design at it's finest. 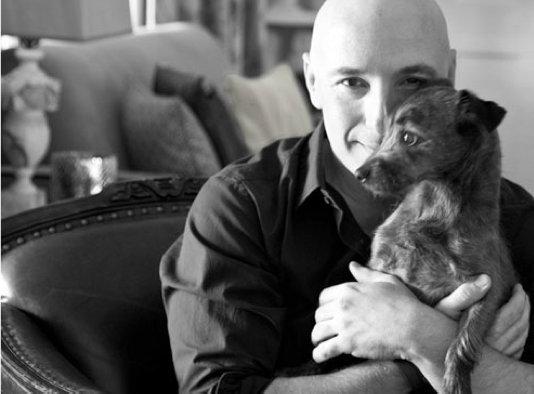 The Mr. Clean of human coffee makers, if you will. In the top image, though, the tamper looks big in relation to the model's hand. I saw it and wondered, "Is he making espresso for a group?" 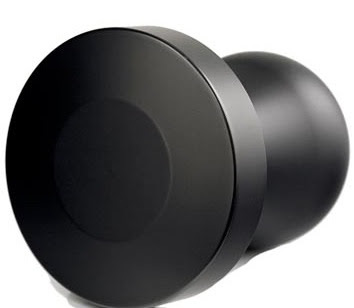 Then again, I've not spent a lot of time noticing the size of tampers. But you're right that they're beautiful. I want to buy one and use it to pound out wee pieces of chicken and meat. Those are goregous! 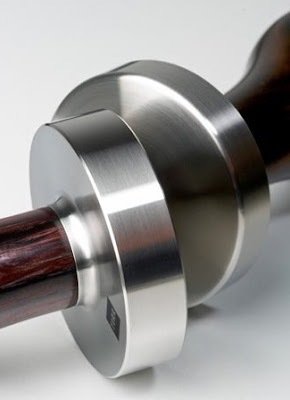 I would love them as door knobs...the wood and steel in particular.